This is a great recipe for potlucks, game day parties, and cookouts. If you don't have access to fresh corn, simply used canned or frozen corn for the recipe. However, when corn is in season, take full advantage of the grill for this tasty dish. Preheat grill for medium-high heat. Brush corn and onion slices with vegetable oil. Place onions on the grill first and cook for 3 minutes per side, or until soft with good grill marks. Remove from heat once done. Place corn onto grill and cook for 3-5 minutes, turning often. The object here is to get the corn kernels slightly charred. Once corn has a nice color, remove from heat. Chop cooked onions and set aside. Place an ear of corn into a large bowl and using a knife, carefully remove kernels. The object is to get as many kernels into the bowl rather than flying around the room. This is why I suggest a deep bowl rather than a cutting board for this job. 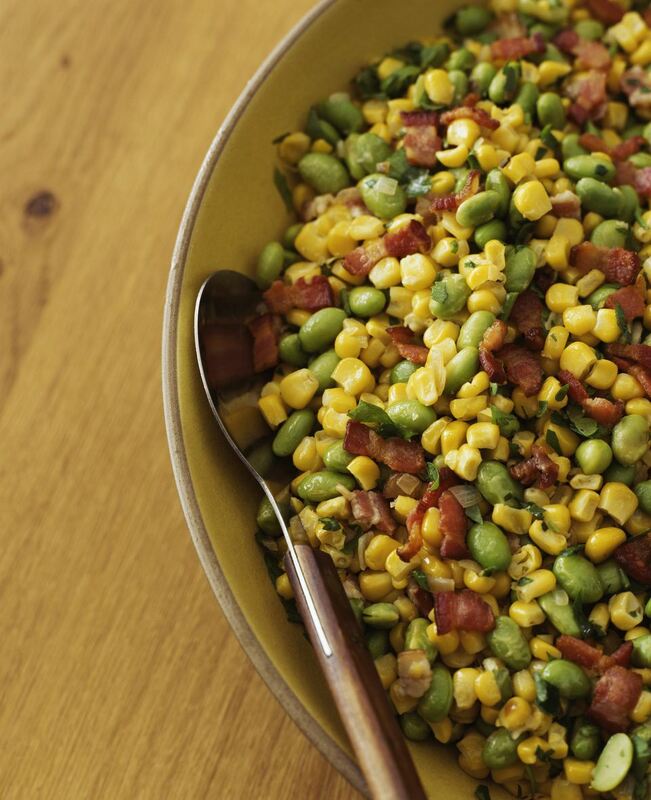 Add edamame, onion, lima beans, cooked bacon (optional), and parsley to bowl. Combine olive oil, vinegar, salt, and white pepper. Pour over top and toss to coat. Check for flavor. Either serve immediately or cover and place into refrigerator until ready to serve. *If using canned or thawed frozen corn, simply add to bowl with rest of ingredients and add vinaigrette over top.